I was debating what to do yesterday, and my options included a hike, a long drive for a whitewater run, or an easy trip escorting Santa into Wickford Village. I opted for the easy trip in Wickford. Wickford is pretty sea-side town whose street are lined with shops and colonial-era homes. Each year the local Chamber of Commerce organizes the Festival of Lights in the village with holiday themed actives. 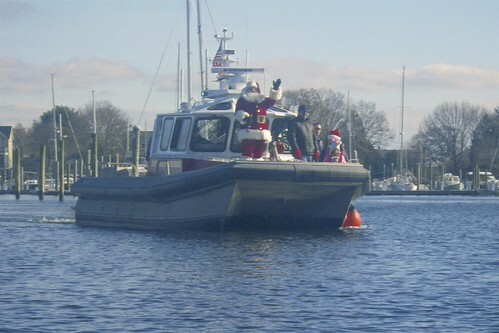 Since 2010, my local club (RICKA) has participated in this event by escorting Santa down the harbor for his big arrival at the Town Dock. 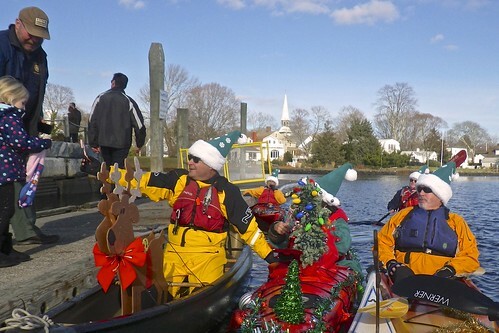 With boats decorated and matching elf hats, we met Santa for the short paddle down the harbor. I was amazed how many people show up for this event. 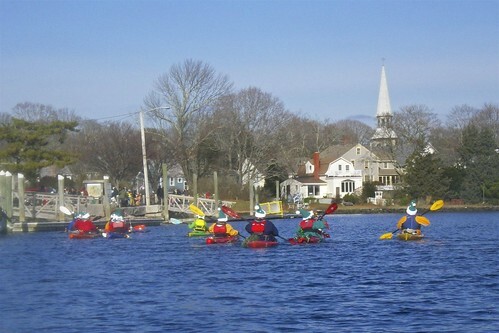 After escorting Santa, we took a little time to paddle the backwaters of Wickford Harbor. Kind of corny, but still fun, and the kids seemed to like the candy canes. Wickford is a beautiful scenic waterfront town. Haven't actually been there in years, since when I was still into "seakayaking" and visited the Kayak Centre for gear. Pretty nice shop right on the water. These days I blow by on my way to 'gannsett or point judith. 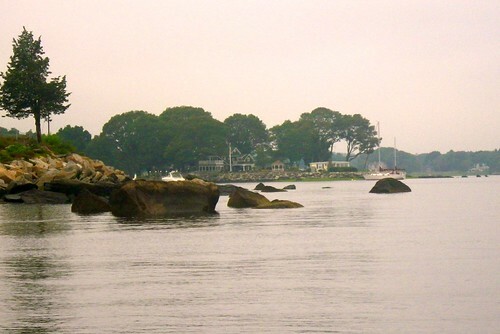 The water in Wickford Harbor was dead flat yesterday, and no wind - not sure how it was down at the beach. The Kayak Centre is still there, but is at different location on Brown Street - they sponsor this Santa paddle. Thanks for escorting Santa! I used to visit Wickford when family vacationing at Grandmother's beach house on Earle Drive in Lone Tree Point in 60's and 70's as a kid. I would to paddle my first kayak, an Old Town Prijon 420 from her place to Wickford in early 80's when stationed across the bay on destroyer DD933 in Newport. That red over natural fiberglass old school WW boat led to a canoe and then a series of kayaks with active paddling today. What a fun thing to do! And on what looks like a beautiful day! Always great to let that kid light shine through, no matter your age in years. Thanks for escorting Santa! I used to visit Wickford when family vacationing at Grandmother's beach house on Earle Drive in Lone Tree Point in 60's and 70's as a kid. I know Lone Tree Point - at least I think I do! I put in in Wickford Harbor, paddled out through the breakwater, and south to get some pictures of the Plum Island Light. I made it as far as Bissel Cove/Fox Island when I realized how far that was to paddle alone in a solo canoe - I whimped out and turned around. I still haven't got a picture of Plum Island Light. I probably drove down Earl Drive looking for a public access point - couldn't find any between the Verrazzano Bridge and Wickford. Yup - it was fun - I'd do it again.